We do not ask for compliments. Every visiting party is invited to fill in a postcard asking for factual information about the condition of the cottage on arrival and for ideas for improvements. We also ask visitors to sign the Visitors Book we got in 2011. This provides space for comments on the right hand page, which has encouraged the literate to write more about their visit that the previous Visitors Book allowed. We have a log book in which people are invited to put their comments at greater length. Our return after a 3 year gap. Fantastic week with glorious weather. A perfect escape. See Log Book 3 page 317 for details. We saw the Eileen Donan Castle. It was very funny inside. Beautiful landscapes. Thank you for everything. Fantastic week. We like the cottage very much and especially our two girls are very sad to leave tomorrow. If possible we will be back. C, S-S, C, N N, Denmark. We enjoyed a lovely week here. Scenery is absolutely stunning. Cottage superb. We did see the ducklings and the sheep rounded up and later sheared. At times perhaps too hot!! [end of May]. Looking forward to returning. Our first visit – wonderful cottage; never been anywhere so organised!! Excellent cottage, wonderful views, everything we all expected. A lovely serene quiet location with very impressive places to visit. 10/10. First visit to area for children and first in over 20 years for me. Every bit as spectacular as I remember. Not been for 3 years – cottage just as cosy and warm. Went as a foot passenger on the Strome ferry for the experience. Wifi excellent. [Don’t get confused about the ferry. The loch side road was closed because of a landslip for about two months, and the Glenelg ferry was brought to Strome to reopen the historic ferry which was closed in 1970]. Many thanks for a well kept homely cottage. First snow this week, accompanied by thunder, lightning, hail, heavy rain, gale-force winds, and then there’s the top of the mountains. Going in search of sunlight! [mid-November]. 3rd visit to John Fisher’s for us and the The Best! Sunshine and warm temps all week! We visit Scotland a lot and this is our fave place. There is a lifetime of climbing and exploring on your doorstep. Sheer bliss and the perfect places to relax and unwind. Mrs MacRae next door is lovely and very helpful. The walk to the Totaig Broch is really worth a visit – enjoy the simply beautiful majestic ancient trees along the way from Letterfearn. First visit to this wonderful cottage and this amazing area. Had a full week of rain and some snow on mountain tops which was a picture. Visited Loch Scalpaidh, Eileen Donan Castle, Plockton (walked up Duncraig Hill). Saw the Cullins from Glenbrittle; Talisker whisky site; Glenelg and Arnisdale. Saw two otters are Kylerhea and walked the coastal path with fantastic views as the light was fading. Attadale Gardens very colourful, then Lochcarron and over to Applecross – quite scary over the misty mountains. The view of the Five Sister from the view point above Shiel Bridge is superb. Look forward to coming back. Our 5th visit to this wonderful cottage. Weather wasn’t good. Drove to Uig on Thursday, absolutely loved it, bought some nice ales from the brewery. Glenelg breathtaking as ever. As always we never seem to bring enough bird food (or may be the birds just eat too much!) Went to the reptile sanctuary on Skye - worth a visit - we have sponsored a baby boa. Until next time X X X. Another lovely holiday in your so comfortable cottage. Saw two otters Friday on along road to Letterfearn. We didn’t expecting to find an accommodation, too pleasant, too sweet, too comfortable, good thought and good organised. Visitors to the cottage (ie members of our walking group who were staying in Kintail) thought the cottage was really nice when they popped in for a ‘cuppa’ when returning from a walk. Today sun is shining so we are hoping to end our week’s walking on a ‘high’ ie Can Ghluasaid. We will return. Cottage very comfortable, warm and cosy. Weather was atrocious but still enjoyed the week. Dolphin trip from Kyle very interesting. Kyle railway line pretty for a trip out. Pheasants, ducklings and birds joined us at the cottage each day. We would love to come back again – for longer each next time. A rather rainy week this year, but we escaped the rain by driving to Duirnish several times. The seaside there is often sunny, whereas the mountains are cloudy and rainy. Like always the cottage is a refuge. Till next year. B & J, Holland [their 18th visit]. The cottage has everything you need – and more. We have been very lucky with the weather. Our first visit to J F Cottage [April]. Visited and enjoyed (thoroughly): Amazing Armadale; Attadale Gardens (splendid); Elgol (breathtaking); Glenelg (beautiful); Eileen Donan castle (perfectly situated); Plockton (delightful – Plockton Stores Restaurant serves excellent delicious food); Portree (lovely – Merchants Bar of hotel excellent food). J F Cottage lovely! 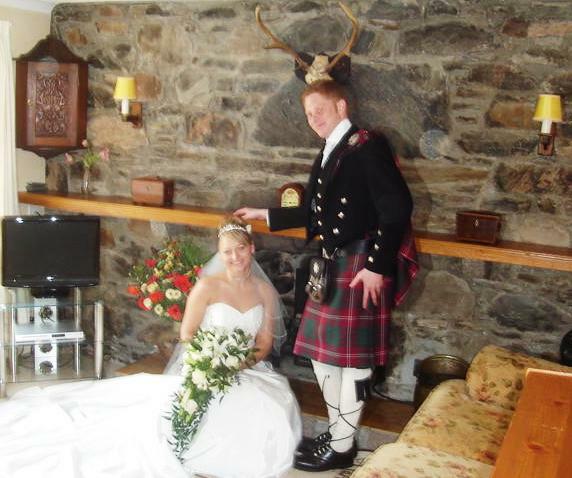 Up for James’ and Jema’s wedding at Eileen Donan Castle. Perfect day – sun, blue skies and wonderful scenery [February]. As always a perfect holiday in our ‘home from home’. Cottage perfect: warm, dry and comfortable [this is mid-January!]. Otters in Arnisdale, sea eagles in Skye, red deer everywhere. Will certainly come again. The first wedding from the cottage since 1969, when the then co-owner, Dave Clarke married Adrienne. 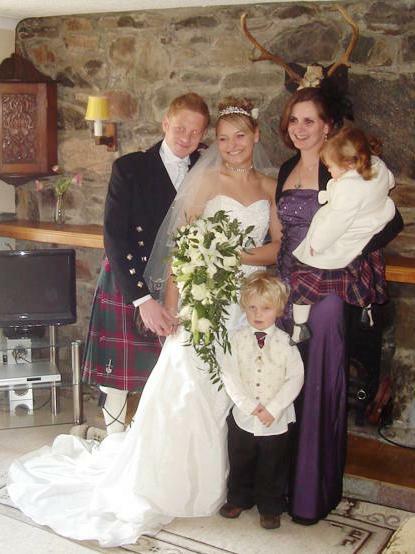 The happy couple are James and Jemma on 12th Febraury 2011. 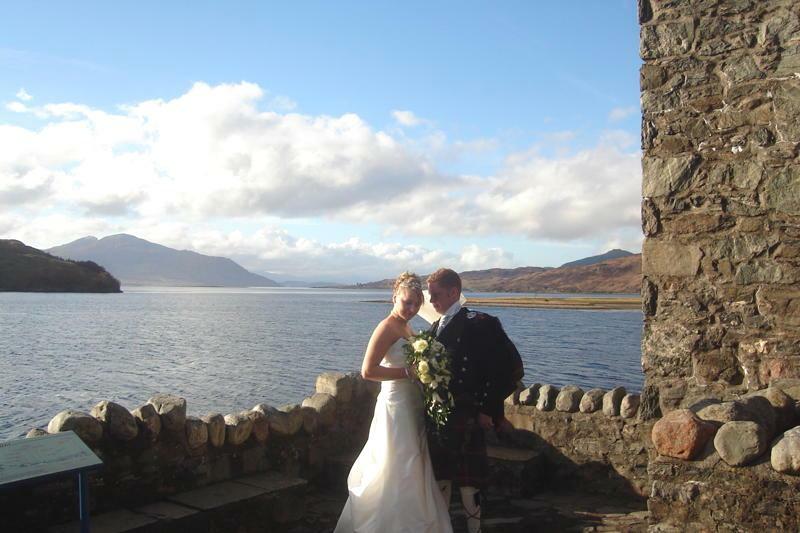 They got married at Eileen Donan Castle.